Engraved nameplates for rooms, doors, offices and work areas. Engraved Nameplates, Signs and Holders | Standard legend engraved nameplates enhance your rooms, doors, offices and work areas. All signs have standard Helvetica font. Sign borders are beveled to enhance appearance. Wall and desk holders available for professional finish. Visit our CUSTOM PAGE for additional information on custom engraved signs. • Specify mounting option: with or without adhesive back. Attractive holders enhance the look of your engraved signs. Sign insert priced separately. Our wall holders come standard with double sided foam tape. Tessa tape and Velcro also available. The following items shown below are various sizes and are priced separately from those listed above. Disclaimer: All products depicted in the image above may not be available. Call to speak with a representative to discuss your specific needs. Balco Sign and Safety produces various engraved products to meet customer needs. 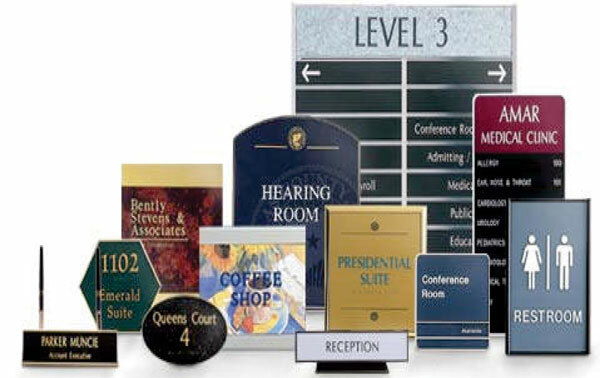 Whether you need a way finding directory, personalized nameplate, room identification, or custom message we are here to help. Call for pricing and availability.